Here's a collection of photos from Thursday, November 5th. Let's start with the mountains. This is the view from the Mickey ferris wheel. 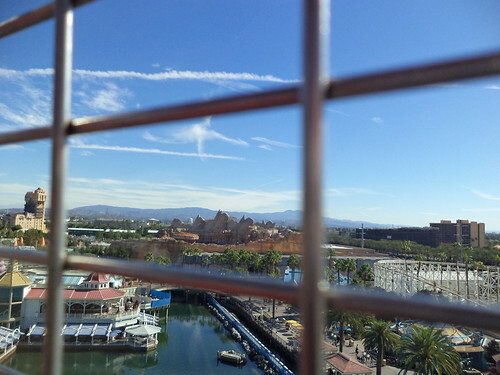 The real mountains are in the distance with the fake mountains from the Cars Land ride in the foreground. The fake mountains don't look all that out of place from the real ones due to the realism of the fake ones. I also like the clouds in the sky. Just needs a couple of vertical lines and you'd have a tic tac toe game in the sky. 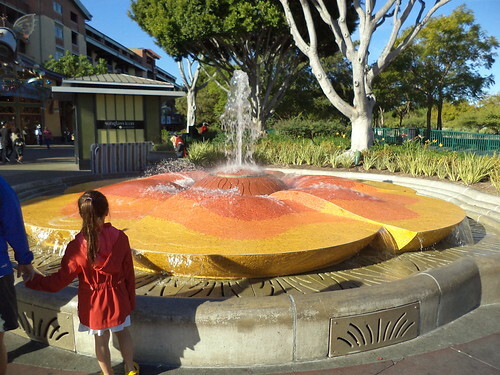 This one is in Downtown Disney. It's a stylized flower. I like the undulating shapes and the gradation of color from center outward. There aren't a lot of fountains around. It wasn't until I was looking through my photos that I realized this isn't a part of the decoration in either park. Fountains take space and they tend to break up a path. Disney is about funneling large amounts of people from one point to another. A fountain is just in the way. Oh you could tuck it off the the side. This one was alongside a thoroughfare, but that seems to defeat the purpose of a fountain as a focal point. This one is quite pretty. The color change was achieved with small tiles. Wonder how long it took people to apply the tiles? 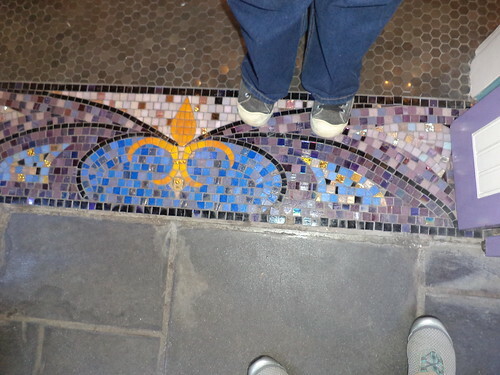 Speaking of tiling, here is the floor in the pseudo French Quarter of Disneyland. 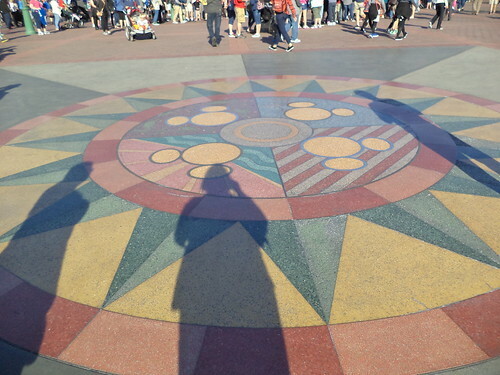 Color and design on the ground is not limited to mosaics. Witness what they did with colored cement. "Cement" is a bit of a misnomer for this ground covering. It's an aggregate which can be tinted in a large number of colors. I've seen this in a lot of places. One of the problems with it in cold climates is that the colors are usually separated by thin pieces of metal. The surface is sealed so you never feel the change from one piece to another. But, the ground freezes in the upper Midwest, so spring heave is a big concern. I've had to inspect designs such as these and you find all sorts of cracks at corners and uneven heave can produce a large crack in, say, the middle of one of the yellow triangles. Ground issues are probably not a problem in Southern California, so they are free to be inventive with the design and color. It was quite impressive. I would do this in a heartbeat if I could figure out how. This was outside the Starbucks where we had breakfast. It's a mesh in which a variety of plants have been planted in what appeared to be a peat-like potting soil. This would be a wonderful way to shade a patio. 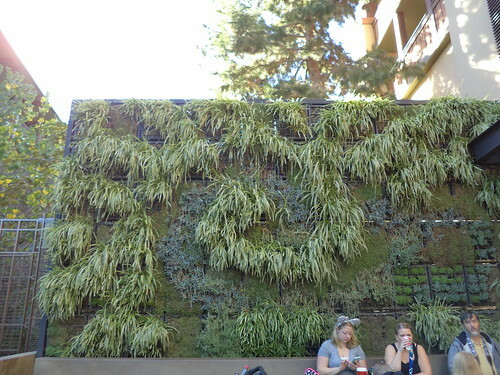 I could see it planted with flowering plants to provide color. It appeared to have a design to the plantings but was in the midst of a change of seasons so some plants were new and not completely filled out. I also loved that, unlike Disneyland, there were birds nesting in the mesh. That, alone, appealed to me. I'm all about providing habitat for nesting birds. I'm sure, if I looked, there are plans online for something like this. You'd need it to be fairly high to block out the sun, but you could make it merely 6-7 feet tall to act as a screen. 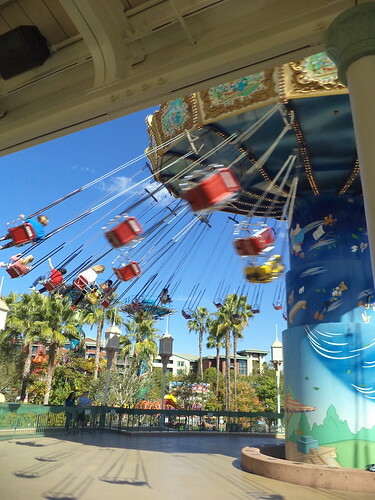 Part of the design of California Adventure is the recreation of an early American amusement park. Witness the roller coaster and the ferris wheel. LOOK! SWINGS! Liz and I walked toward the ferris wheel and she pointed out this ride. I love this ride! I am at the edge of fitting into the chairs but it was an absolute hoot. I have so many, many warm memories of county fairs with a swing ride. I wouldn't go up in a ferris wheel, but I'll let a ride fling me almost sideways with nothing but a chain to hold me to the top. You are never too old to have your feet dangling in front of you, the wind in your face, giggling for all your worth, while your 9 year-old self comes bubbling to the top for a ride. That's Disneyland, for you. It's okay to be on the backside of your middle ages yet riding swing rides.